Raw meat can now be purchased & cooked to taste. Don't leave it on the oven too long or it'll get crispy (thanks for suggestion Dragonslayerwei & Hermit). Barring any crash issues, I plan to update Primary with all the Potato test updates soon! 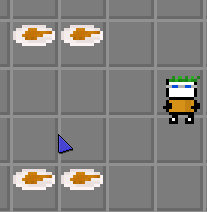 On the Browser version, Meat appears as Chicken. Chicken appears as Chicken, too. i wanna eat hot soup 🙂 can you make some dessert to game too like icecream. wanna already cook pumpkins even its i,playsible on now. Does not cooked meat stacks with cooked meat? Cooked steak should give more hp than raw or burnt meat. Right now, there is no real reason to cook it. burnt steak: does 1 damage when you eat it.